Geology is more than the study of rocks as inanimate objects. Some of the oldest and most interesting applications of geology involve interactions between humans and the noble wine grape, Vitis vinifera. A stone chapel looks out over the Red Willow Vineyard in Washington. The states glacial history shapes the vineyards, which are second only to California in terms of volume of wine produced in the United States. All photos courtesy of Larry Meinert. Mounds of grape seeds in prehistoric caves testify that early people had more than a passing acquaintance with wine. Grapes naturally ripen to high sugar levels and, left on the vine, they will begin to ferment from the action of native yeasts on the skins. Perhaps our early ancestors plucked such fermenting fruit and with a smile, plucked a few more. Or maybe they observed the erratic flight of birds that had feasted a bit too much and wondered, as scientists are wont to do, about cause and effect. Regardless of how people came to appreciate the joys of the grape, there is ample evidence in the earliest written documents that they were making and enjoying wine. The records of the ancient Egyptians and Greeks contain observations that certain regions seemed to produce better wine than others. This observation carries through to modern times where the question is brought to a sharp focus by the rather simple occurrence of two vineyards, side by side, that share most obvious aspects of climate, slope and viticulture, yet produce crops that are vastly different  its geology at work. Decades of research by French geologists and other scientists, such as James Wilson in his classic 1998 book on the geology of French wines (see On the Shelf), has shown that property boundaries, dating back centuries in many cases, mirror underlying faults, facies changes and other variations in geological properties. This observation is the essence of terroir (pronounced tehr-wahr): that geology can be used to understand and explain the mysteries of the grape. A person does not need to enjoy or even have experienced great wine to wonder about the mysteries of terroir; it is amply treated in almost all great world literature, from the Bible through Shakespeare to the modern musings of Hunter S. Thompson. Simply put, terroir involves the complex interplay of climate, soil, geology and culture that influences the character and quality of wine. It is common, although usually incorrect, to point to a single factor as the explanation: Its the soil. Its the water. Its the limestone. Terroir is the integration of individual factors that contribute to wine quality, and to make matters even more complicated, there is the variable of time. What may be good terroir in one year may be less so in another. For example, in years that are relatively warm and dry, vineyard X with a particular slope, elevation, sun angle and soil type may produce better wine than a vineyard Y, whereas the reverse may be true in years that are cooler and wetter. The general topic of terroir is of growing international interest, with numerous recent publications and symposia devoted to it, including at the 2003 national Geological Society of America meeting in Seattle, the 2004 Geological Association of Canada meeting in St. Catharines, Ontario, and the 2004 meeting of the International Geological Congress in Florence, Italy. Because all geologists have the training to address this topic and more than a few geologists have a moderate interest in alcoholic beverages, it might be of interest to outline the basics of terroir. My research on terroir and the geology of wine bloomed during 22 years at Washington State University in the midst of one of the worlds great wine regions  the Columbia Valley of Washington, nearby areas of Oregon and the Okanagan of British Columbia. Recently I moved across the country to Smith College in New England only to find that many of the same fundamental geologic factors, especially glacial processes, are of pivotal importance to the local wine industry, such as the emerging vineyards of the Finger Lakes and Long Island in New York (see story). The glacial history of the vineyards of Washington provides an excellent illustration of these general processes. 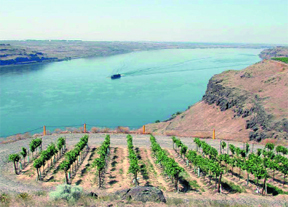 A barge travels across the Columbia River below the Wallula Vineyard in Washington. Washington State is second only to California in terms of the volume of wine produced in the United States and, some would argue, second to none in terms of wine quality. Although there is considerable local variability, most Washington vineyards sit on soils formed from Quaternary sediments that overlie Miocene basaltic rocks of the Columbia River flood basalt province. The Columbia River Basalt Group erupted mostly between 17 and 11 million years ago (early Miocene) from north-south fissures roughly parallel to the present-day Washington-Idaho border. The estimated volumes of the groups individual flows are at least 3,000 cubic kilometers, making them the largest documented lava flows on Earth. The basalt bedrock is overlain by unconsolidated sediments deposited by glacial outburst floods and eolian processes. About 18,000 years ago, a lobe of the Cordilleran Ice Sheet blocked the Clark Fork River near the Canadian border in northern Idaho and created glacial Lake Missoula, which covered 7,800 square kilometers of western Montana. The ice dam failed repeatedly, releasing the largest floods documented on the planet. In south-central Washington State, the many paths of the onrushing floods converged on the Pasco Basin, where floodwaters were slowed by the hydrologic constriction of Wallula Gap before draining out through the Columbia River Gorge to the Pacific Ocean. This constriction caused backflooding of local river valleys and basins that resulted in deposition of relatively fine-grained slackwater sediments, characterized by rhythmically graded bedding; these graded rhythmites locally are called Touchet beds, and researchers have found multiple sets, indicative of multiple floods. In the last stages of the Pleistocene and continuing through the Holocene, prevailing southwesterly winds eroded slackwater and other glacial sediments and redeposited them into the present thick blanket of loess that covers much of the Columbia Plateau. These windblown soils form the backbone of agriculture in most of eastern Washington: More than 90 percent of Washington State vineyards are planted in appellations affected by the glacial floods and loess. Geologists have made correlations between vineyard performance, wine quality and the underlying soil and rock units in Washington and in other world wine regions, such as France and Italy. As interesting as the bedrock is to geologists, few grapevines can grow in solid rock, and thus the soils developed on these materials are of immediate interest to all viticulturists. Soil development is an ongoing process that is the culmination of hundreds to millions of years of weathering. Just as maps of bedrock geology are available for most of the United States, maps of soil types are available from the United States Department of Agriculture Soil Conservation Service. Usually organized by county, most maps include detailed aerial photographs or topography with overlays of the main soil series. Each soil series is named after a local town or geographic feature and has a characteristic soil profile. Soil series can be subdivided on the basis of slope, grain size and other characteristics that affect soil use by people. Collectively, geologic, topographic and soil survey maps provide essential background data for any characterization of terroir. For example, the Ciel du Cheval vineyard in the Red Mountain AVA (American Viticultural Area) in Washington has a relatively low slope with homogeneous air drainage and regional climate. Three different soil types are exposed in the vineyard that cut across the north-south rows of vines. For nine years, Jim Holmes has owned and managed the Ciel du Cheval vineyard. Thus, the vineyard has a consistency of management style that might allow for examination of possible viticultural variations as a reflection of underlying geology. Initial results of grape analyses suggest that there are differences that might correlate with soil types. And an ongoing study of wine sensory analysis over a three-year period has been designed to test whether different soil types can be correlated with statistically significant wine flavor profiles and compositions. Previously, researchers have correlated such sensory differences with a variety of terroir variables. Climate is one of the more important components of terroir. In some ways it is the most difficult to evaluate because it varies in both space and time. Three different scales delineate the many weather variables: macroclimate, mesoclimate and microclimate. On a continental to regional scale, macroclimate controls the length of the growing season and other long-term trends and extremes. On a regional to vineyard scale, mesoclimate encompasses topography, elevation, slope, aspect and proximity to bodies of water or other moderating influences. Microclimate ranges from the scale of a vineyard down to individual vines, grape clusters and even smaller domains if measurement permits. While macroclimate can vary on a geologic time scale (millions of years), both mesoclimate and microclimate can vary seasonally, daily or even hourly. Human activities, such as urban development, wind machines, irrigation and canopy management, affect mesoclimate and especially microclimate. Although many climatic variables can be measured, four of the important factors are temperature, humidity, wind and sunlight (solar radiation). These data and others are collected systematically by a variety of meteorological services and are often automated and publicly available. For several regions of Washington, such climate data show that Red Mountain has on average 200 more growing-degree days (a measure of effective photosynthesis) than nearby Yakima Valley, and Walla Walla has more than twice the precipitation of Red Mountain. Similar regional comparisons are possible using other types of terroir data. For example, more than 90 percent of Washington vineyards are located in areas affected by glacial outburst floods thousands of years ago. In the Red Mountain area, these flood sediments were mostly deposited from the swirling back-eddies behind Red Mountain and include numerous lenses of relatively coarse gravel. In the Walla Walla area, the flood sediments are generally finer grained due to deposition from ponded floodwaters, although there are some zones of coarse gravels in modern river channels. Many other wine-producing areas of the world also have links to glaciation. This is primarily due to two factors: worldwide lowering of sea level during maximum glaciation and the locally abundant sediments produced by glaciers. 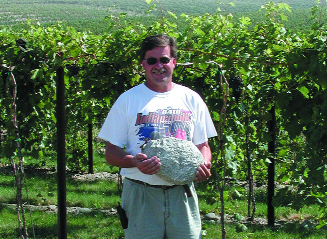 Winemaker Gary Figgins of Leonetti Cellars holds a granite glacial erratic found in the Seven Hills Vineyard, Walla Walla, Washington. Glaciation is important to winemaking, largely in providing sediments conducive to grape growing. A prime example of these processes is the Graves-Medoc region of Bordeaux, France. Outwash gravels from glaciation in the Pyrenees Mountains along the French-Spanish border and the Massif Central in central France overloaded the Garonne and Dordogne rivers leading to the Gironde Estuary, which itself had been enlarged and deepened by the lowering of sea level. Each period of glaciation produced its own series of gravel outwash floodplains along the rivers and the best (so-called First Growth) vineyards are all on the same type of gravel. Names such as Chateau Lafite Rothschild, Haut-Brion, Latour and Mouton-Rothschild are well-known to wine lovers throughout the world, and each of these estate vineyards is located on these gravel mounds, particularly the stratigraphic unit of the Günz gravel. Less well-known are the gravel outwash plains of the South Island of New Zealand, which were fed by the extensive alpine glaciation of the Southern Alps mountain range that transects southern New Zealand. These gravels form the substrate for many of the vineyards in the Marlborough area of New Zealand, and some of the wineries of this region focus on the coarse gravels for their best vineyards. Another area in New Zealand, Gimblett Gravels, is perhaps the first viticultural region in the world to specifically define itself on the basis of the gravel. Legally, wines from this appellation have to consist of at least 95 percent grapes grown on the Gimblett Gravels. 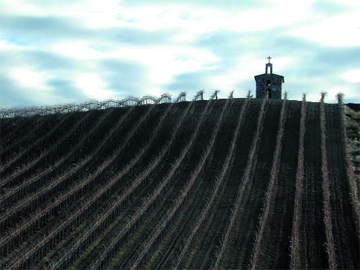 Gimbletts wines owe their unique flavor not only to their gravelly existence, but also, like all wines  whether in Washington, France or elsewhere  to large differences in climate, culture and viticultural practice. The study of terroir does not aim to minimize the different factors or the importance of human ingenuity in making great wine from great vineyards, but simply to illustrate the importance of understanding the physical environment as one essential element of terroir  a topic that should be of interest to all geologists. For 30 years, petroleum geologist Bill Gipson has followed his curiosity about Earth to an unlikely spot: winemaking. He owns the Pheasant Ridge Winery, just 10 miles north of Lubbock, Texas. Wine in Texas? You bet. In fact, people have been growing wine grapes in Texas since the late 1800s, when the Val Verde Winery (still in operation today) started up in Del Rio, west of San Antonio on the Rio Grande. Now more than 50 wineries strong, Texan wines place in national competitions and are grown in several areas of the state. Gipsons quest for Texan wine began in the 1960s, when he was working for Pennzoil. He decided to investigate different spots in Texas to identify the ideal terroir  soils, climate, geology  for growing wine-quality grapes. What he found, he says, was that the Texas high plains grew grapes that offered the nearest thing to French wine. While the plains are not as scenic as the French wineries of Bordeaux, Gipson says, they offer a similar environment for wine grapes. Pheasant Ridge is a 50-acre winery that started when a Texas Tech University student and his family bought a farm in the Texas high plains and decided to try to grow grapes. At an elevation of 3,400 feet, the grapes are treated to cool nights and warm days  much like in Napa Valley  allowing them to grow slower and to develop fuller flavors. Additionally, the grapes grow in calcareous loam, a soil that drains easily and also allows the grapes to develop well. Gipson bought into Pheasant Ridge in the early 1980s and became owner in 1993. He and his son now operate the winery. The winerys Cabernet Sauvignon and Chardonnay have won in national competitions. Trivia: The state grew grapes in the late 1800s, but most wineries sprang up in the last 20 years. Trivia: Vintners first began growing grapes for wine here in the 1600s, and later cultivators included Thomas Jefferson, but the real boom has been since the 1970s. Trivia: In the early 1800s, well before California became a state, Missouri was second only to New York in wine production; by the 1880s, Missouri was producing more than 2 million gallons of wine annually. Trivia: Cool climate with unique maritime microclimates yields very similar production to Alsace and Champagne in France. Trivia: Both are located on volcanoes  Tedeschi Vineyards (started in 1974) on a cattle ranch in Maui, and the Volcano Winery (started in 1985) on the Big Island, which is Americas southernmost winery. Meinert is a professor of geology at Smith College in Massachusetts, after having been a professor at Washington State University for 22 years. His teaching and research cover a wide range of fields, from exploring for gold mines to liquid gold in bottled form  fine wine. He also has operated a small home winery for 20 years, specializing in barrel-fermented Cabernet Sauvignon and Syrah from select Washington vineyards. E-mail: lmeinert@email.smith.edu. Baker, V.R., and Nummedal, D., eds., 1978, The Channeled Scabland (a guide to the geomorphology of the Columbia Basin, Washington): National Aeronautics and Space Administration, 186 p.
Bianca Cita, M., Chiesa, S., and Massiotta, P., Geologia dei Vini Italiani: Paesaggi Geologici, Be-Ma editrice, Milano, Italy, 127 p.
Bretz, J H., 1923, The channeled scablands of the Columbia Plateau: Journal of Geology, v. 31, p. 617-649. Bretz, J H., 1925, The Spokane flood beyond the channeled scablands: Journal of Geology, v. 33, p. 97-115, 312-341. Gladstones, J., 1992, Viticulture and environment: Winetitles, Underdale, Australia, 310 p.
Greenough, J.D., Fryer, B.J., and Mallory-Greenough, L.M., 2004, Regional Characterization of Canadian Wines Using Trace Element Concentrations by ICP-MS: Geological Association of Canada Annual Meeting, Abstracts with Programs, v. 36. Haynes, S.J., 1999, Geology and Wine 1. Concept of terroir and the role of geology: Geoscience Canada, v. 26, p. 190-194. Haynes, S.J., 2000, Geology and Wine 2. A geological foundation for terroirs and potential sub-appellations of Niagara Peninsula wines, Ontario, Canada: Geoscience Canada, v. 27, p. 67-87. McGovern, P.E., 2003, Ancient Wine: The Search for the Origins of Viniculture: Princeton University Press, Princeton, New Jersey, 365 p.
Meinert, L.D., and Busacca, A.J., 2000, Geology and Wine 3: Terroirs of the Walla Walla Valley Appellation, Southeastern Washington State, U.S.A.: Geoscience Canada, v. 27, p. 149-171. Meinert, L.D., and Busacca, A.J., 2002, Geology and Wine 6: Terroir of the Red Mountain Appellation, Central Washington State, U.S.A: Geoscience Canada, v. 29, p. 149-168. Moran, W., 2001, Terroir: the human factor: The Australian and New Zealand Wine Industry Journal, v. 16, #2, p. 32-51. Waitt, R.B., 1985, Case for periodic, colossal jökulhlaups from Pleistocene glacial Lake Missoula: Geological Society of America Bulletin, v. 96, p. 1271-1286. Wilson, J.E., 1998, Terroir: The role of geology, climate, and culture in the making of French wines: Mitchell Beazley, London, UK, 336 p.